Thanks to Newsletter2Go you don’t need to worry about accidentally emailing a subscriber who has recently opted out as our newsletter software offers automatic unsubscribe management. Some think it’s safe to assume that emails won’t reach people who’ve unsubscribed recently. Unfortunately, it’s not always the case. Therefore, it’s better to be safe than sorry and block the contact altogether and put it on a newsletter contact blacklist. Only then you will be 100% sure that the contact won’t be accidentally written to. You could also put your contacts on a Robinson List with Newsletter2Go. Newly imported recipients can, upon request, be directly compared with the Austrian ECG list. Thanks to this add-on, you will automatically comply with the email marketing rules in Austria. What is a Robinson List? A Robinson list is an opt-out list of Internet users who don’t wish to receive marketing communications. It’s an equivalent of the United States National Do Not Call Registry or British Telephone Preference Service, however it extends to other marketing transmissions (email, postal mail, fax). With Newsletter2Go you can create your own Robinson List with contacts. 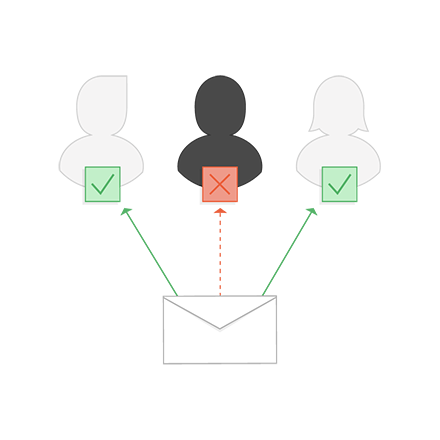 Putting a contact on a newsletter contact blacklist is your best bet. If you decide to remove an address, it might be re-imported and solicited with unwanted emails all over again. However, addresses that found its way tot he newsletter contact blacklist, won’t be ever imported and will remain on your list. What is interesting is that recipient blacklisting works for entire domains as well. That means that addresses on certain domains won’t be able to register for your newsletter and will not receive double opt-in emails. Furthermore, contacts stored on the newsletter contact blacklist can no longer subscribe to your newsletter. Therefore, you can completely exclude the possibility that unsubscribers will ever get to hear from you again. In this way, you protect yourself against unnecessary spam complaints. It is also possible to import contacts directly on the Robinson list. Even if you re-upload your newsletter contacts from an Excel file, blocked contacts will stay on the list. This comes very useful, especially if you want to change from a different newsletter tool to Newsletter2Go and you want to transfer unsubscribers. Even when unsubscribers are re-imported, they will remain blocked and won’t be contacted in any case. Newsletter contact blacklists are subject to the strictest privacy protection. Therefore, your contact data won’t ever be public.